In a past life (that's pre-babies to you & me) I was an avid festival reveller. I went to every single one of them. Every single year. My absolute favourite was Bestival, on the Isle of Wight, and which always fell on my BFF's birthday, which of course meant we HAD to go. I loved that the weather was always amazing, it involved a proper road (and boat!) trip, it always had THE BEST line up and, most of all, that it was fancy dress! This year I am RIDICULOUSLY excited about taking Daisy & Evie to their very first music festival, and I'm even more excited that it's going to be Camp Bestival! Yes, from 1-4 August, the entire Modern Mummy family will be camping in the beautiful surroundings of Lulworth Castle in Dorset and enjoying four days of music, literary and foodie wonderfulness. I'm most excited about seeing Richard Hawley, Tom Odell, I Am Kloot and Beardyman and Daisy is looking forward to Mr Tumble, The Gruffalo and the Fancy Dress Parade. But that's not all Camp Bestival has to offer, oh no. Just look at this line up! The little sister of my beloved 'grown up' Bestival, Camp Bestival is the perfect festival for kids, with lots and lots and lots for them to see and do, and the best part is that all of the acts and activities have been picked so that us adults will enjoy them too. In fact, everything about Camp Bestival has been thought up with families in mind - from the whimsical, fairytale like decorations to the Baby Temple (for feeding and changing teeny tiny ones) to the huge selection of open-all-hours food stalls to the spectacular entertainment. This is the perfect introduction for kids into the festival way of life and tickets are available here. 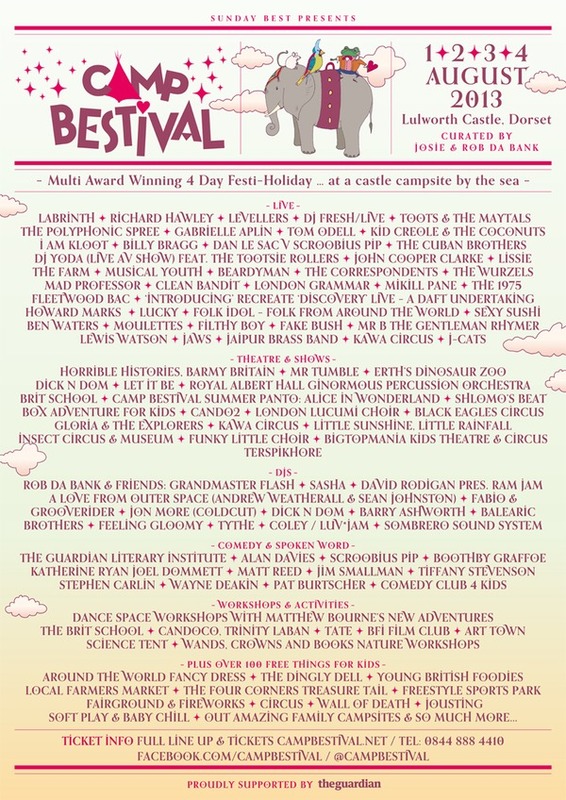 DISCLAIMER: Camp Bestival have given us tickets in exchange for a review after the event.